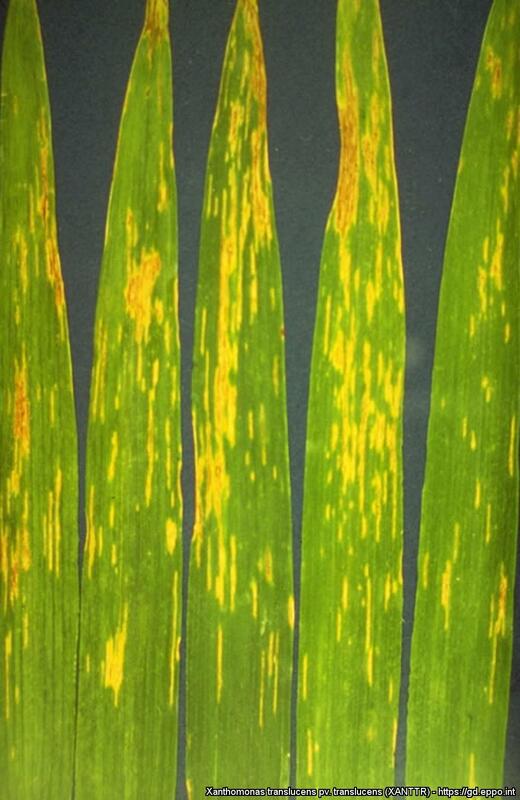 Flag leaves showing symptoms of infection with Xanthomonas translucens, copyright E. A. Milus. 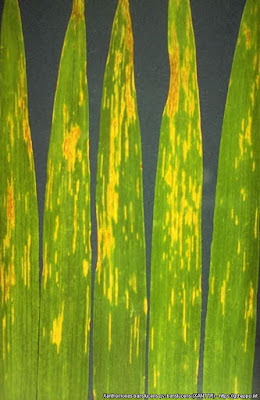 Xanthomonas is a genus of motile, rod-shaped bacteria found growing in association with plants, often causing diseases such as bacterial spots and blights. Prescott, L. M., J. P. Harley & D. A. Klein. 1996. Microbiology 3rd ed. Wm. C. Brown Publishers: Dubuque (Iowa). Roumagnac, P., L. Gagnevin, L. Gardan, L. Sutra, C. Manceau, E. R. Dickstein, J. B. Jones, P. Rott & O. Pruvost. 2004. Polyphasic characterization of xanthomonads isolated from onion, garlic and Welsh onion (Allium spp.) and their relatedness to different Xanthomonas species. International Journal of Systematic and Evolutionary Microbiology 54: 15–24.